What Is Pearl Couscous? How to Cook Pearl Couscous? Pearl couscous or Israeli couscous is a type of pasta made of semolina flour and is much larger than the regular (smaller) granular couscous variety. It’s pretty versatile and can be used in place of rice or smaller pastas in soups or salad. It takes minutes to cook, which makes it a great candidate for Sunday meal prep. Unlike the granular version of couscous, you cook pearl couscous like you would pasta – in a pot of boiling/salted water for about 10 minutes. I got the inspiration for this pearl couscous salad from my local grocery store. They sell a similar salad in their deli department that hubby loves. Of course, you know I had to try my hand at a homemade version! Can Couscous Be Eaten Cold? 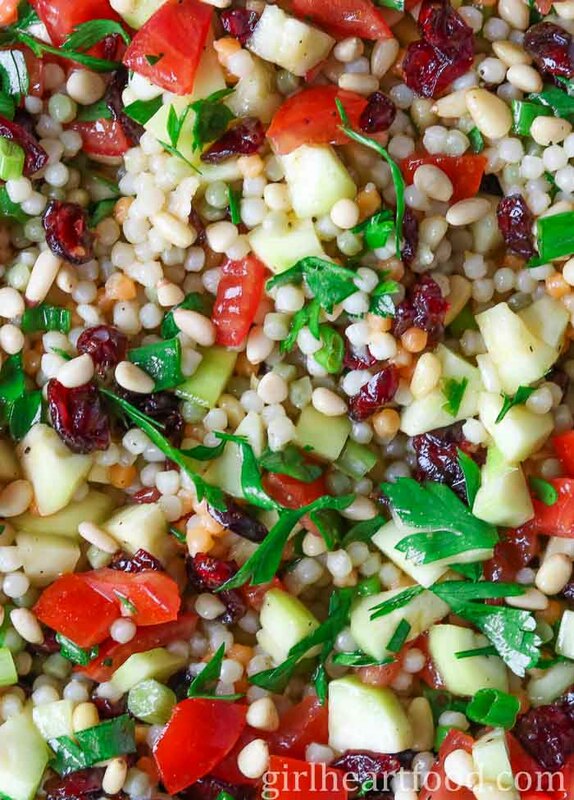 This couscous salad recipe can easily be made ahead. The cranberries work beautifully in this salad and adds a nice pop of sweetness to the other savoury ingredients. However, golden raisins work great too! I prefer to peel the zucchini in this recipe, but if you don’t want to, don’t. Pine nuts are delicious, but they are also expensive. Feel free to sub in another nut, like sliced almonds. 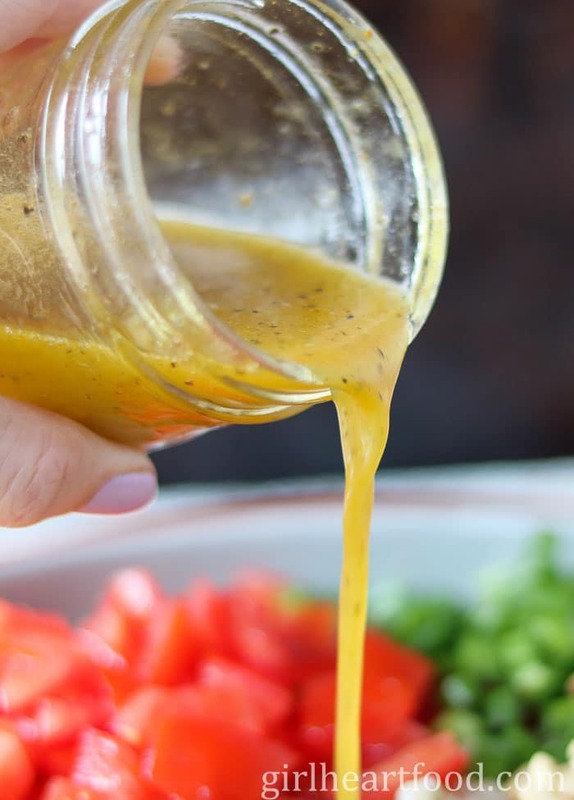 For this simple vinaigrette, I used turmeric, which is supposed to be great for ya with anti-inflammatory properties. Though, not the same, curry powder is also a lovely substitute. Do not, though, get that turmeric on anything you don’t want ruined. That stuff stains, man…even your hands. Speaking from experience here! Simply place them in a mason jar and get shakin’! Pour over salad and stir to combine. What Goes with Couscous Salad? 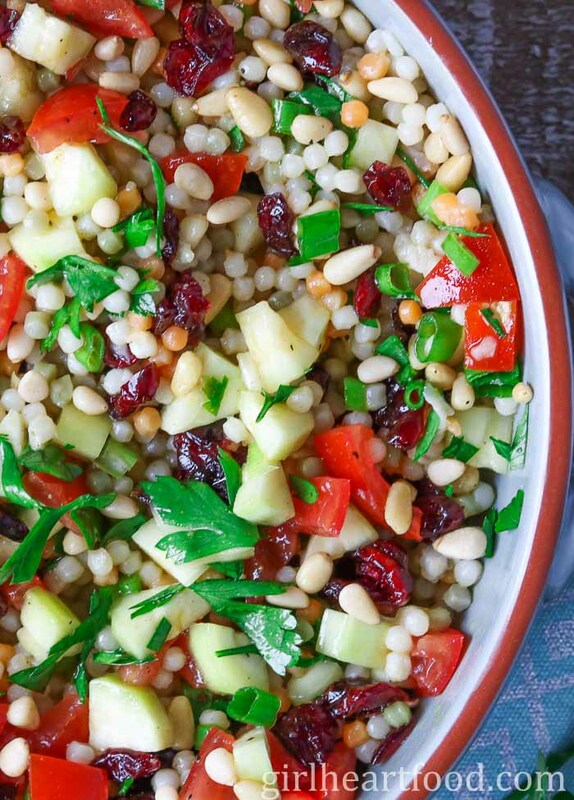 Hope you love this pearl couscous salad! This easy plant based Pearl Couscous Salad is made with sweetened cranberries, zucchini, tomato, parsley and pine nuts. It's tossed with a lemony turmeric dressing and makes for one easy side to dinner or light lunch. Cook couscous per package instructions. For mine, I place 1.5 cups of cold water, 1/2 tsp of salt and 1 cup of couscous in a medium pot. Bring to boil, lower heat, cover and cook about 10 minutes. Turn off heat, leave covered for a couple minutes. Rinse with cold water and drain. Mix cooked couscous with zucchini, cranberry, tomato, pine nuts, green onion, and parsley. In a small mason jar combine olive oil, lemon juice, maple syrup, salt, black pepper and turmeric. Cover and shake to combine. Pour over couscous mixture. Stir to combine. Enjoy!